This slug was brought in to Buckinghamshire County Museum yesterday. 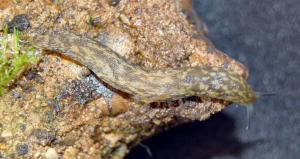 I think it is Limax maculatus, a species that was formerly confined to the coast but seems to be spreading inland as well. I'm not absolutely certain of the identity though and am seeking confirmation, especially as this would be the first record for Bucks as far as I know. The slug was just over 6cm long when extended and active.